DiscoLights is a portable tool designed to animate your computer screen, by displaying a row of blinking lights. DiscoLights can read audio input from a microphone or line-in and adapt the lights dynamic to the rhythm and frequency of the music. Remember old style light (color) organ? DiscoLights can visualize any supported audio source (microphone, line-in and etc.) on your computer with color LED lights. Chain of seven lights with customizable size can be located anywhere on your screen in horizontal or vertical position. The software’s interface is simple and fun: it consists of a row of seven light bulbs that are turned on and off according to the music beat. It is designed to enliven your desktop at parties, for instance, by acting as a music visualizer. The colored bulbs that light up at the beat of a note may remind you of the arcade organs, with colored keys, that would glow up, when pressed. The software’s interface is simple, meaning it does not contain other elements, except for the lights, which creates a fun effect against dark backgrounds. You may reposition the lights sequence anywhere on your desktop, even set it on two monitors, if such configuration is in place. By default, the series of colored lights is positioned horizontally, but you may also set it to stand vertically. Additionally, you may resize the light group in order to obtain a more intense effect. 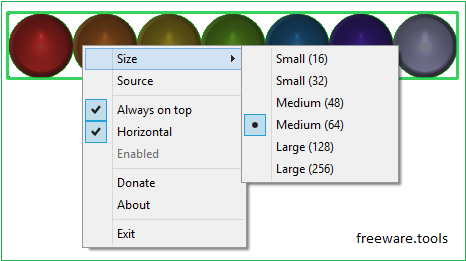 You may choose between the available sizes, expressed in the diameter of a light bulb. Thus, a light disc may vary in size, from small (16 by 16 pixels), up to large (256 by 256 pixels). The same size configuration is applied to all lights simultaneously, which means that the entire group can be significantly enlarged between the first and the last options. If multiple input sound sources are configured on your computer, you may select which one you wish the software to follow. Thus, if you select the microphone, the lights may turn on and off according to the rhythm, thus acting as a frequency visualizer. The actions may also be influenced by sound volume level or beat, so DiscoLights can be a party starter.